All types of design have trends. Whether it is shoes, furniture or interior design, trends reflect a measurable change in behavior that develops within a group or culture. Sometimes the trend is to take something away. Eventually we miss whatever it was, so the next trend is to bring it back. Take, for instance, the dining room. 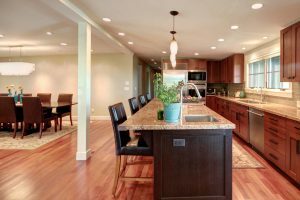 A staple element in gracious home design for centuries, however, in recent years, new houses have replaced the formal dining room with a more casual great room concept or have eliminated it all together. Now the dining room is making something of a comeback, though with a bit of a more functional twist. To discover your position on the subject, you should analyze how you actually live. 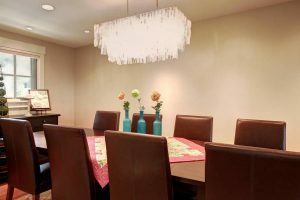 Having a formal dining room is a misuse of square footage if you rarely use it, but it still makes sense if your lifestyle will put it to work. The name “formal” dining room implies a certain style of gathering. This is not a group of people hanging out together, cooking and eating while watching a football game. A formal dining room creates an atmosphere conducive to different activities, namely a more quiet focus on stimulating conversation and a break in the hectic pace of our usual everyday activities. 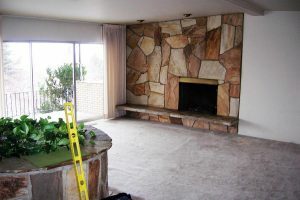 BEFORE: In the remodel, the dining room and kitchen swapped places and a wall was removed to open them both to the living room. If we think back to early pioneer-era cabins, we had the original great room. Everything — including eating, cooking, and even sleeping — were contained in one simple space. As prosperity increased, homes in our area grew in size and sophistication and began to reflect the more cultured society that many had left behind. The dining room was a symbol of prosperity. 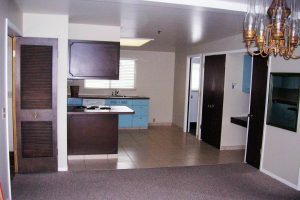 Not only did your house have to have room for one, but there was a true social distinction between the dining room and the kitchen. Ideally, the hostess was in the dining room socializing with the guests while others were in the kitchen working away to create the meal (think “Downton Abbey”). 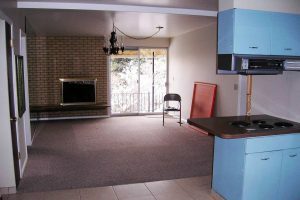 AFTER: In the remodel, the dining room and kitchen swapped places and a wall was removed to open them both to the living room. The trend pendulum swung far and wide, and entertaining became an extremely casual affair. With all three functions of gathering, dining and cooking combined into one space, guests have even been called on to lend a helping hand with meal preparation and cleanup. We have learned to enjoy the process as much as the product. But, as pendulums are wont to do, they sometimes swing too far. We now have a generation of children who only eat at island/bar seating and could not tell us what the word “centerpiece” means. Some feel this means it is time to swing back the other way and resurrect the dining room and its attendant manners and lifestyle. If you decide you want a dining room how big should it be? We always tell our clients that we do not design for Thanksgiving dinner. The size of the dining room you need will depend on how many people you typically serve. How big is your family? Do you have regular guests that need to be counted also? One issue with a self-contained dining room is that there is a limit to the space. Ideally, you will be able to account for enough extra space to accommodate an extra leaf or two in the table for special events and holidays. To determine how much space you need, use these guidelines: Provide 24 inches of width for each person seated at the table. A 36-inch wide table is great for intimate conversation, but won’t allow for serving pieces. A 42-inch table will hold 10-inch platters; a 48-inch wide table will hold 12-inch platters. The table should be a minimum of 36 inches from the wall to allow for seating and some passage space behind seated diners. So, could there be a happy medium? A compromise between the totally casual and totally formal? Of course, the answer is yes. The great room concept is still a common and popular option. A great room also doesn’t have to mean one big open room containing three separate functions. Designing the great room is actually about having an open concept with designated zones for the kitchen, gathering and eating. Each zone can be distinguished by using architectural design features such as columns, beams, flooring, furniture placement or ceiling treatments, to name a few. 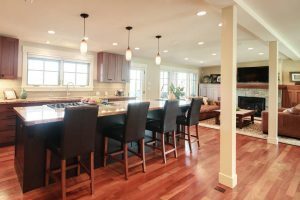 In the spirit of compromise, a dining room can be connected to a kitchen or family room with a wide, framed opening. This allows visual and spacial connection while maintaining the boundaries of the dining area itself. Finally, dining areas/rooms can be used for more than just sitting and eating. A bookshelf-lined dining room can double as a library or even an office, if the user is a very neat type-A individual. Well, whether you decide to keep, add or spruce up your formal dining room or create a great room instead, we hope you have fun at your next party.